Rugambwa was born on 12th July 1912, in of an aristocratic family in Bukongo village, Rutabo-Kamachumu; Bukoba district, North west of Tanzania on the bourder with Uganda. His father was Domitiani Rushubirwa and the mother Asteria Mukaboshezi both of royal families. He was propheticlly given the name of Rugambwa meaning 'the renowned'. The local chief had forbidden any religious activity on the plateau of Kamachumu, thus Rugambwa as a young boy had daily to walk 20 Kilometers to Kagondo Parish for catechism. He was baptised by Fr. Emil Verfurth, a Missionary of Africa (White Father) on 21 March 1921. That same year he was baptised permission was given and a parish was opened by indigenous diocesan priests at Rutabo. After baptism he continued with the primary school education in the village. In 1926 he was selected to join the junior seminary of Rubya where he studied till 1933 when he joined the major seminary at Katigondo Uganda. In all his training, he was taught by the missionaries of Africa (White fathers) who evangelised Bukoba and southern Uganda. Among his teachers at Katigondo was Joseph Kiwanuka the future bishop of Masaka. 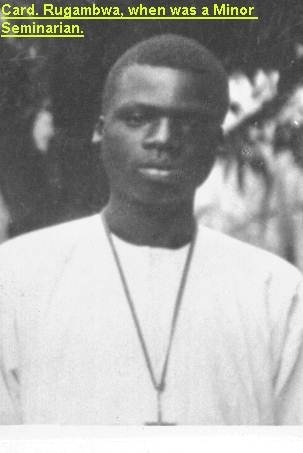 Rugambwa was ordained priest on 12 December 1943 at Rutabo by bishop Burchard Huwiler. After ordination he was appointed to Kagondo parish and latter to Rubya parish. He often narrated on how interesting the pastoral work was; he was fortunate to have a bicycle with which he travelled up to 50 kilometers to give services. In 1948 he was transferred to Kashozi parish, the oldest parish in the diocese. He had very lively memories of his pastoral work in the parish especially at the outstation of Katoma, six miles from the town of Bukoba. It was at this time that Rome was thinking of dividing Bukoba vicariate and making the second experiment of a vicariate in black Africa, lead by an African after Masaka in Uganda. Rugambwa was selected for studies in Rome for that purpose. In Rome while lodging at St. Pater's College he studied Canon law at the PontificalUrbanCollege both belonging to propaganda Fide. In 1948 Bishop Burchard Huwiler of Bukoba reached the age of 80 and as his health was not good he retired. Bishop Tetrault was appointed to replace him. Unfortunately after two years his health deterioted and he died in 1951. In this situation the arrangements of separating the vicariate were accellerated. On his return, after his graduation with a doctorate in Canon Law, Rugambwa was appointed to Rubya for a short time and later to Kashozi Parish. 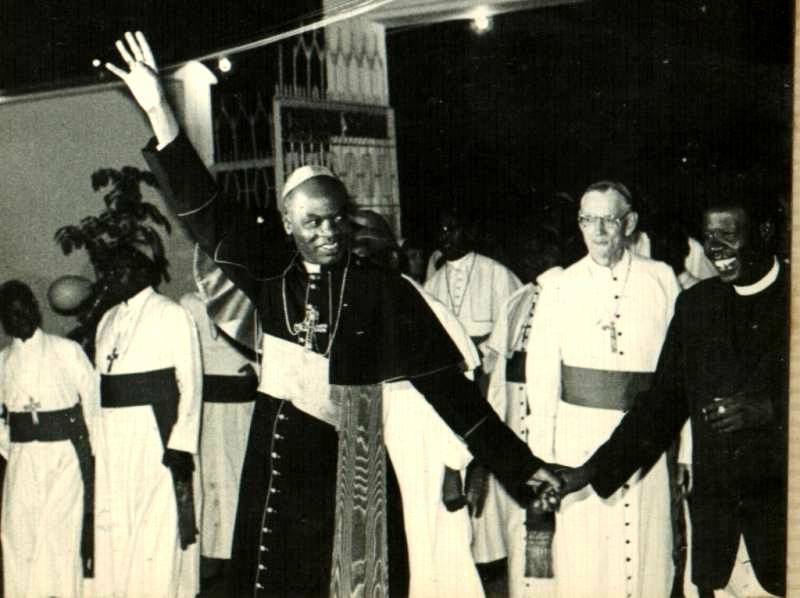 On 16th December 1951, Laurean Rugambwa was nominated bishop of the new Vicariate of Lower Kagera, cut off from Bukoba Vicariate with 5 parishes and 17 indigenous priests. He was ordained on 10th February 1952. In 1953 the vicariate was raised to a diocese of Rutabo. The diocese was run by an exclusively African clergy, all determined to prove themselves. They managed with little financial support as they had little outside contacts. Under him with success they organised the people to support their diocese. In recognition of these successful efforts, Pope John XXIII elected him the first African cardinal in history in March 1960. He was created Cardinal on 28th March 1960. The same year cardinal Rugambwa was transferred to Bukoba diocese. Which had been cut into two. His Bukoba diocese comprised of the then district of Bukoba while the new diocese of Rulenge under Bishop Alfred Lanctot comprised of the districts of Karagwe, Bihamulo and Ngara. In his diocese he organised people into social guilds and trained many people, both men and women, locally and abroad. A number of them were destined to hold important posts of leadership in the country. By 1969 he had developed the diocese both spiritually and materially through hospitals and schools. Among the hospitals are counted Rubya Hospital and Mugana Hospital, among the schools is the major seminary of Ntungamo and the girls secondary school called after him, 'Rugambwa secondary school'. 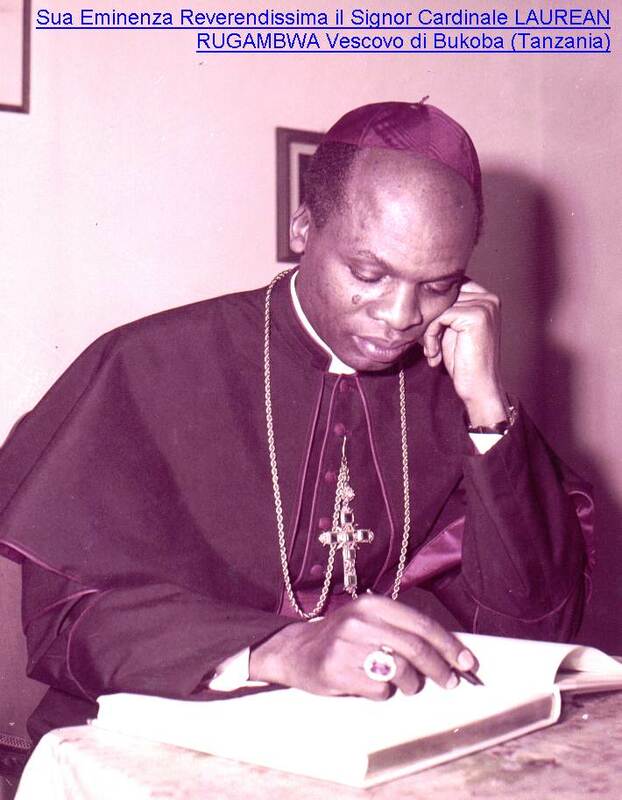 In 1969 he was nominated the Archbishop of the Capital city of Tanzania Dar es Salaam. He was its pastor till 1992 when he retired at 80 years. Here he introduced religious from different congregations both men and women. This helped him to open many parishes in the predominantly Moslem city. Like in Bukoba in dar es salaam he introduced the spirit of self reliance. He built its first catholic hospital at Ukonga. He built a major seminary at Segerea and a junior seminary at Visiga. At the end he founded a women religious congregation for Dar es Salaam, the Little Sisters of St. Francis of Assisi. Both in Bukoba and Dar es Salaam, he was the undisputed leader of all religious denominations, the Catholics, Protestants and Moslems. They all accepted his leadership in common negotiations with the government. All governments respected him and took seriously his word. 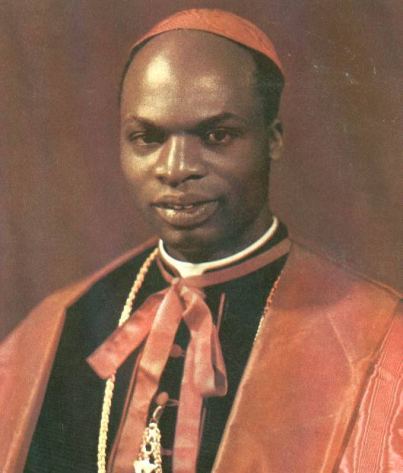 His Eminence Cardinal Laurean Rugambwa died on 8th December 1997 at 22.15 hours. His body was laid to rest in the church at kashozi the first mission in Kagera region, north of Tanzania. A good devotion developed around his tomb with people coming from far to pay their homage and say a prayer. However, following the completion of the renovations of the Cathedral Church his body was transferred and reburied into the Cathedral church on 6th October 2012. It was a colourful event. He is remembered for his simplicity, pastoral concern especially for the spiritual and social needs of the people, and his solicitude for the pastoral workers. His relationship with all including the government officials was amiable. He has left a rich legacy to all especially in the places he has worked.